Photovoltaic glass is a special glass with integrated solar cells, to convert solar energy into electricity in a clean, quiet and reliable way. This type of system differs from the Solar Panels that have been around for some time, which are mainly used to produce hot water. 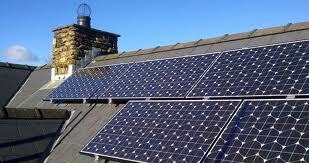 Photovoltaic systems are comprised of photovoltaic cells, devices that convert light energy directly into electricity. Because the source of light is usually the sun, they are often called solar cells. Photovoltaics are often referred to as PV. This means that the power for an entire building can be produced within the roof and façade areas. The house remains connected to the electric utility at all times, so any power needed above what the solar system can produce is simply drawn from the utility. The need for correct, safe installation of this type of system is critical and to ensure installers are assessed to nationally agreed standards GQA has worked with Industry experts to create a fit for purpose qualification. Because the qualification stops short of commissioning the system there is no requirement for a qualified Electrician to be involved in the work required to complete this qualification - the commissioning of the system will be dealt with by a qualified individual. There is currently a Level 3 qualification being developed for those completing Surveys for PV Installations and also those involved in Service, Repair and Maintenance of PV systems.